How to get more out of feedback. What can we learn from President John Tyler? Should we switch to a blog? Should we change the format of TGL ? Amuse yourself and learn something new. In a training session, many facilitators use traditional storytelling techniques. They tell a story to inform, inspire, and influence the participants. The facilitator is active but, unfortunately, the participants are passive just listening to the story. In the interactive storytelling technique, the facilitator conducts an exercise that requires the participants to actively create, share, and process their own stories. We explored three different types of interactive stories in the past three issues of TGL . Here's the fourth one. This technique provides a futuristic setting and requires team members to co-create stories. After presenting a set of principles and briefly explaining each of them, I asked teams of participants to project themselves into the future, create science-fiction scenarios, present the plot line of their stories, and analyze the stories for common themes. Here are the details of this interactive stories activity. You look at the date of the newspaper. Another shocker. It is dated May 17, 2030. Organize teams. Ask the participants to organize themselves into teams of three to six people who have a handout of the same color. Give instructions. Ask the participants to read the handout. Explain that the top of the page contains the shocking headline from January 6, 2030. The rest of the page contains instructions for teamwork: Each team should create a timeline of a chain of events that led to the state of affairs depicted in the newspaper headline. Teams should begin with today's date and make list of events that led to what happened on January 6, 2030. Each event should be logically connected to the next one in the list. Ask the participants to limit their timeline to one page of the flipchart. Announce a 7-minute time limit. Start the timer and tell the participants to begin. Read the headline from The Utopian Herald dated January 6, 2030. Avoid external causes (such as economic boom) over which we have no direct control. Begin from today and work toward January 6, 2030. Read the headline from The Dystopian Herald dated January 6, 2030. Relate the headline event to the violation of principles of human performance technology. Here's another interactive storytelling exercise that is set in the future. Unlike the previous activity, Galactic Wormhole , which has a pessimistic element, this one has a guaranteed happy ending. It involves roleplaying elements combined with a futuristic plotline. To create personal visions of successful application of the skills and knowledge acquired in the workshop. Form teams. Ask the participants to organize themselves into teams of three to five. Ask the team members to seat themselves facing each other. Brief the participants. Inform them that they are going to participate in a roleplay. After the groans die down, tell each participant to play his or her own role. The only difference is that the roleplay takes place in the future, 12 months later. So everyone will be a year older and wiser. You three bumped into each other at the O'Hare airport. You have a long layover and you decide to walk down to the bar and catch up with personal news. After a couple of drinks, one of you asks, “Hey, remember the workshop we attended last year? Did you ever use any of that stuff in your workplace?” This triggers a wave of nostalgia and you try to outdo each other with your reports of glowing successes. Provide roleplay details. The roleplay will come to an end after 4 minutes. Participants don't have to take turns. They talk to each other as in a normal conversation at the bar. Encourage imaginative exaggeration. Explain that the participants' main goal is to flaunt their success and attribute it to the workshop. They have poetic license to exaggerate how their fame and fortune have taken a quantum leap. Advise participants not to be modest in making up their history of the next year. However, encourage them to relate the brilliant results to specific aspects of this workshop. Leave them alone. Let participants act out the roleplay. Walk around various triads, unobtrusively listening to the glowing reports. Conclude the session. At the end of the 4 minutes, stop the roleplay. Invite volunteers to reflect on the details of the startling success stories they heard. Training, tutoring, or coaching individuals is a frequent activity in the workplace and at home. This jolt incorporates a matchstick puzzle to identify effective techniques for one-on-one tutoring. After the debriefing discussion, you end up with a useful checklist for tutoring individuals. The facilitator teaches a puzzle-solving procedure to a few participants. These participants tutor the other participants on a one-on-one basis, setting up a chain reaction. At the end of 3 minutes, the participants who were tutored by the others discuss the techniques and identify the effective ones. To identify and use effective techniques for tutoring individuals. Learn how to solve the puzzle. Collect 16 matchsticks or tooth picks. 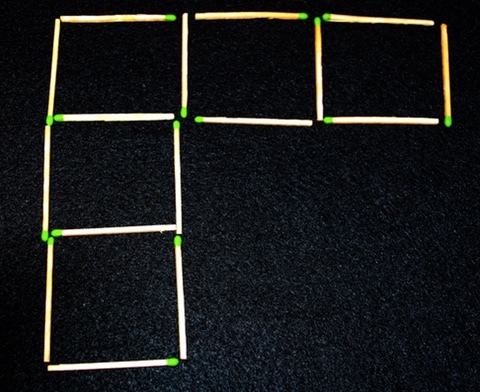 Arrange them according to the figure in the Matchstick Puzzle handout. Try to solve the puzzle without looking at the solution. After you have figured out the solution (or given up in total frustration), watch this animation that shows how to solve the puzzle. Practice solving the puzzle and get ready to teach the procedure to others. Brief the participants. Distribute the puzzle handout and 16 matchsticks to each participant. Tell the participants that they are going to learn how to solve a puzzle. Invite them to attempt to solve the puzzle without outside help. Assemble a group of tutors. Ask the participants if anyone already knows how to solve the puzzle. Ask these people and a few others to come to the front of the room. You should have three to seven people in this group, depending on the number of participants in the entire group. Teach your tutors. Demonstrate how to solve the puzzle. Help the tutors to master the procedure and get ready to tutor the others. Ask the tutors to teach others. Tell them to tutor the other participants how to solve the puzzle. Emphasize that they should tutor only one participant at a time. When a participant has mastered the procedure, he or she is appointed as a new tutor and sent out to recruit other participants and tutor the procedure. The original tutors should also continue selecting and tutoring other participants. Remind the new tutors to teach others. Keep reminding the original tutors and the new tutors to continue tutoring more participants. Announce a time limit of 3 minutes. Explain that the goal is to help as many participants as possible to solve the puzzle within the time limit. Conclude the tutoring session. Blow the whistle at the end of 3 minutes. Announce the end of the tutoring period. Reassure the participants that everyone will be taught the procedure if they have not yet learned it. Proceed to the debriefing discussion. Invite the participants to recall the tutoring techniques that were used. Invite them to identify the tutoring techniques that were effective. Record the responses on a flip chart. Ask the participants to work in groups to come up with a list of five important dos and don'ts for effective tutoring. Distribute copies of the handout, How To Tutor . Encourage the participants to compare this checklist with the list of dos and don'ts they came up with. Ask the participants to tutor those who have not yet mastered the puzzle solving procedure at a later time. Also encourage them to tutor their friends and family members. In doing so, remind them to use the effective tutoring techniques. See the checklist, How To Tutor . Challenge: Move four toothpicks to create four squares of the same size. Ask the learner how he or she would like to be taught. Use a job aid or a diagram to support your tutoring activity. Demonstrate the technique clearly and slowly. Make sure that the learner can observe what you are doing. Identify different steps in the procedure. Give a suitable name for each step. If you are teaching a complex procedure, break into simpler parts. Demonstrate each step and ask the learner to practice the step. Encourage the learner to practice the skill several times. Provide specific constructive feedback to the learner based on what he or she does in the practice attempts. Be supportive of the learner. Encourage the learner with suitable praise based on the practice attempts. Avoid the temptation to show off your skills or to lecture to the participant. Encourage the learner to continue practicing the new skill frequently. Also encourage the learner to tutor other people. I have great respect for trainers and facilitators who pay of a lot of attention to the room set-up. They include my colleagues who draw precise diagrams to indicate how the chairs should be arranged in an auditorium, banquet, or crescent style around the tables. They are also the people who arrive at the meeting room an hour ahead of time and move the furniture around to meet their needs. Me? I don't bother about the room arrangement. Actually, I like to be surprised. I have this theory that a messy room makes my creative juices flow. I remember being assigned to a basement ballroom at an ASTD annual conference. There were too many people in this medium sized room—and too few seats. Some people sat on the floor in front of the room and some stood along the walls in the back. To make matters worse, there were six huge pillars in the room, blocking people's lines of sight. Participants rushed madly to surround the pillars. They piled up on each other, reminiscent of stuffing telephone booths in the late 1950s. In the process of helping their team to win, participants demonstrated appropriate icebreaking behaviors. During the ensuing debriefing discussion, many participants commented on how the spontaneity of the activity encouraged them to be spontaneous in their own behaviors. Room set-up: Chairs arranged in straight lines. Training topic: Leadership and communication. I took one look at the room set up and thanked my lucky stars for providing the perfect arrangement for an experiential exercise. I told the participants to organize themselves into four groups of six. I asked one person in each group to act as a non-participating observer. I assigned myself the observer's role for the group that had only five members. I asked each group to spend 7 minutes to plan how to rearrange the chairs in the room to permit teamwork and small-group discussions. I called the observers and gave them specific suggestions on what to watch out for. This activity provided valuable experiences related to communication and leadership. I conducted a debriefing discussion with these types of questions: Who assumed the leadership role? Who talked the most? Who came up with the best ideas? How did you listen to the others in your group? To the people from the other groups? How did you attempt to persuade the others? Who kept track of the time? Who took notes? What would have happened if I assigned the leader's roles to specific participants? Nowadays when someone from my client's organization asks me, “How would you like the meeting room to be set up?” I automatically respond, “Surprise me”. Ask participants to take 2 minutes to jot down three problems they're experiencing that are related to the training topic. Once they've done so, have them choose 1 of the problems from their list, turn to a partner next to them, and provide a 1-minute summary of their chosen problem. It is now their partner's responsibility to offer suggested solutions. After 3 minutes, have participants switch roles. Engagement Emergency decks usually sell for $59.95 (plus $10.95 for shipping within the USA). If you order now, you will receive a $10 discount. You can purchase each Engagement Emergency deck in our online store for $49.95. No need to enter a coupon code—as long as you order before December 31, you'll get the discount automatically. Here's a piece of practical advice on receiving feedback and benefiting from it. To prevent other people from stealing it, I have encrypted this piece of advice. Please try the puzzle out at http://thiagi.com/pfp/onlinepuzzles/tgl-2014-12/ and tell us what you think by using the comments link below. Plan your training session with your left brain and implement with your right brain. Be organized—and flexible. The goal of your training is to enable your participants to go beyond mastering new skills to applying them on their job. Ask for feedback on your feedback. Ask the receiver for suggestions to improve the way you give feedback. Trainers should play the role of learners—and invite learners to play the role of trainers. Begin your training session with an activity that sets up the expectation of frequent interaction. Make sure this activity is relevant. In this episode, Matt Richter begins a new series exploring leadership lessons learned from US Presidents. This first episode looks at the ascendency of Vice President John Tyler as he becomes the first VP to step into the shoes of a dead President. While Tyler's administration was filled with missteps and misguided decisions that helped lead the US to Civil War, Mr. Tyler's behaviors as he took office set a standard for how leadership transitions should occur. Against often patronizing and contemptuous attitudes from both allies and enemies alike, Tyler asserted the power a Vice President has upon taking over the Presidency. His insistent and assertive approach led the way to peaceful and stable transitions that had previously not been defined. While we may castigate Tyler for his role in nearly breaking the Union, we can learn a lot from his leadership upon William Henry Harrison's death. Tyler is a complex and completely fascinating figure and we explore one of the more intriguing stories of this turbulent time in our history. You can subscribe to, or download, the podcast on iTunes, or use the link above to get it from our website. One of the words in this message is “feedback”. But it is not the first word! As individuals or as members of a team, we frequently encounter blocks that prevent us from completing necessary work. Should we stubbornly push through the tough stuff or take a break and come back to the task refreshed? Spark a conversation with your team or with your mentor using this 99-Word Story, discussion questions, and interpretation. Power Tip: Do something small to get started and chip away at complex tasks. Read more in the November 2014 issue of Firefly News Flash : http://www.thefirefly.org/Firefly/html/News%20Flash/2014/November%202014.htm . We are thinking of converting the Thiagi GameLetter ( TGL ) from a monthly online newsletter to a blog. We would like your inputs about this planned change. You are probably familiar with blogs. You may be a regular reader of several blogs. You may even be publishing your own blog. So you are in an excellent position to give us advice. Should we change TGL from an online newsletter to a blog? What might be some of the advantages and disadvantages of publishing TGL as a blog? In the November 2014 issue of TGL we asked our trainer-readers how they conclude their training sessions. As of November 25, 2014, 28 readers responded. As a follow up to the poll, we asked the readers to briefly describe their favorite closing activity. For me, the “one word you got out of the day” is fresh and dynamic, and gives a high-energy end to the session. I ask people to spontaneously give me the word that pops up in their mind when they think of the day. The word can be about the content, the form, the emotions…. Then I go around, ask the word, repeat it loud, and move on with a fast rhythm. I like to use weather icons to help participants describe what the workshop was like. Was it sunny, cloudy, foggy, rainy …? Bodhi tree. Make a tree with three branches on a chart paper. Give each participant 3 Post-Its of different colors. They have to write about three things on the three Post-Its: One new thing they have learned, one thing they have un-learned, and one learning that got reinforced as a result of the training. Then stick the three Post-Its in the three respective branches of the Bodhi tree. After everyone has done this, I read out and discuss from the Bodhi tree. After a Q & A, I usually provide a quote based on the topic. It poses discussions that encompass the entire learning process. A Speech from The Throne where participants fill in the blank spaces of a prepared speech with the key thing they learned in each activity they did throughout the day. Filling in the blanks consolidates the highlights of the learning on one page. They then read their speeches to the whole group if there is time, or to their table group if time is running short. Each participant signs a contract with what they will do with the information they learned. They put in an envelope and give to someone who will hold them accountable. Approach all feedback conversations as collaborative problem-solving sessions. Note: Due to popular demand we have extended the deadline for this survey. Of course there are many other magic videos done by other talented people. Some of them are actually TED presentations viewed by millions of people. More about these later.